Growing up in India, and my best comfort food was fenugreek leaves soup with lots of garlic and turmeric. Here in London, it’s difficult to find fresh fenugreek leaves. And even if you find it, the process of plucking the tiny leaves is long and laborious. A few days back I brought this bitter-sweet, fragrant leaves, but it wilted away waiting for its turn. I finally showed it mercy and plucked its leaves and left them soaking in water to wash. After 15 minutes I was surprised to see the wilted leaves came back to life and looked as fresh as plucked straight from the plant. Soaking in water replenished the lost moisture in the leaves. The problem with dry hair is something similar. It lacks moisture, and that is the reason your hair is dull, brittle and straw-like. And once you replenish moisture, it will come back to life just as the tiny leaves did. But for your hair, you will need more than water. You will need plant power + water. Before we delve into herbs for dry hair, first let’s see what is dry hair. You can label your hair as dry if it looks and feels ‘Dry’. Okay, let me try again, if your hair is dull, brittle, lacklustre, with fly-aways and difficult to comb, you can call it dry hair. Another distinguishing thing is dry hair is never straight; it’s either wavy or curly. Whatever the reason may be – washing hair too often, using harsh soap, heat styling, excessive chemical treatments or genetic (blame your parents :-)) – dry hair basically lacks moisture. In healthy hair, the moisture content is anywhere between 10 to 12 per cent. When it falls below that, your hair will start to get dry, brittle and stiff. Most of the time, we don’t need rocket science to figure out an answer to a particular problem. And for your dry hair, the simple answer is to restore the lost moisture. Daily or regular moisturising will hydrate your hair and bring back its shine and elasticity. Which means your hair will look healthy and feel soft and smooth to touch. It’s easy to reach out for moisturising products from the market. But if you have been left disappointed time and again by their promise of glossy hair, it’s time to take help of herb power. Also, store-bought products may be loaded with silicone, fragrance, preservatives and detergents — all of them can do more harm to your hair and scalp in the long run. Herbs are not only safe, they are also super effective to add tons of moisture and conditioning into your dry, unruly hair and make them soft as silk. Don’t confuse marshmallows (sweet) with marshmallow root. But the name has a link. In the olden days, marshmallows were made using the gummy properties of marshmallow root. Not anymore, now they use the gelatine for gumminess. That spares the marshmallow plant root for hair. But what makes marshmallow root ideal for dry hair? It’s the same gooey and slippery properties. The biggest benefit that the marshmallow has to offer to the dry hair is its mucilage content. When combined with water, it swells and becomes a gel-like texture. This slippery quality coats the hair shaft and acts as an intense moisturiser and hair softener. In fact, you can replace your regular conditioner for marshmallow root infusion. It provides slip to help detangle thick wavy or curly hair. As an added bonus, marshmallow root will nourish hair and improve its shine and gloss. Yes, these seeds are from the same fenugreek leaves plant that I spoke about. Fortunately, you don’t have to labour over the seeds; you can buy them in a packet, ready to use. Fenugreek seeds are also abundant in plant mucilage and help to condition and moisturise your hair. Regular use of this herb in a hair mask or as a conditioning rinse will soften your hair and restore shine and texture. You will also notice that combining becomes easier – so no more hair breakage. There’s more to fenugreek than just conditioning hair. These tiny golden seeds are rich in plant proteins which help nourish the hair follicles and promote faster and healthier new growth. Because of its anti-inflammatory nature, they also remedy dandruff and other scalp conditions. It’s the same common sage or kitchen sage that you find in the herb section of grocery shops. I first came across ‘sage benefits for hair’ when I was looking into natural ways to darken hair. 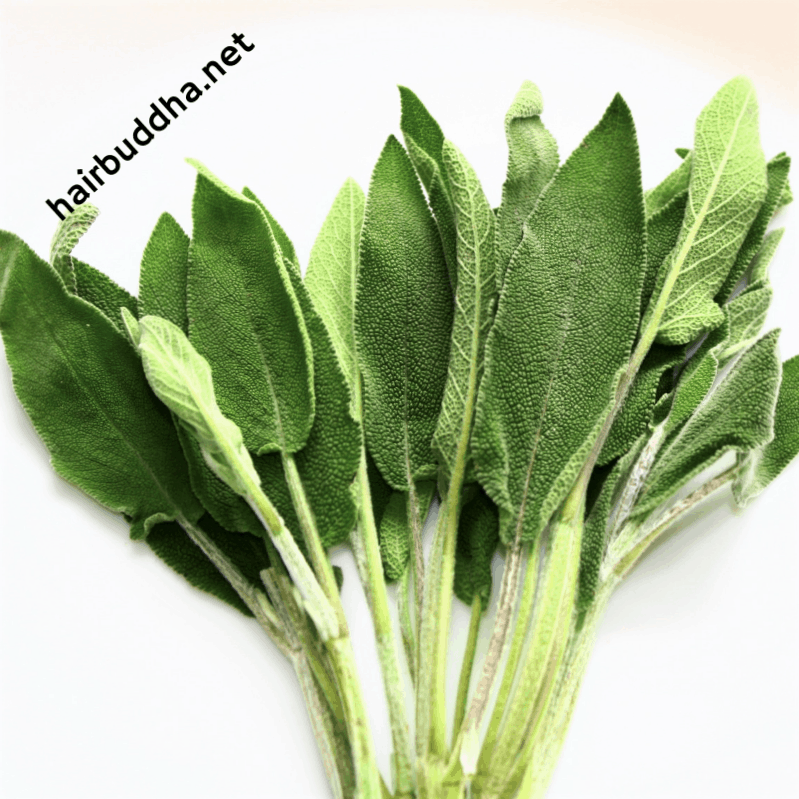 It seems that sage has been used as a natural hair dye for hundreds of years. But sage has another advantage. It works beautifully to make hair silky-soft. The green-grey colour leaves contain phenolic compounds and essential oils that coat the hair and scalp and restore lost moisture. This also helps with scalp dryness. Besides, if you live in hard water, sage will solve your hair crisis. It helps to remove hard water build up that may be weighing the hair down to leave it clean and shiny. If you are hair buddha reader, you would know that I have given up store-bought conditioner years ago and never looked back. The herbs- marshmallow root, fenugreek seeds and sage are my absolute favorite. They do the job of conditioning so well you won’t miss your regular conditioner. Plus, you will get freedom from synthetic preservatives, fragrance and detergents. So why not get nature working, and you will see how well it works to beautify your hair…. Place the herbs and water in a pot. Bring to a boil, then reduce the flame and let it simmer for 5 to 10 minutes. If you are adding hibiscus, the water will turn deep red and looks very pretty. Switch the flame off and let it cool down, then strain. Your herbal conditioning rinse is ready to use. If you prefer Sage leaves, then go ahead and use it instead of marshmallow. Or you can choose fenugreek seeds**. It’s really up to you; all three herbs are very competent in their jobs. **If you are using fenugreek seeds, I suggest you soak them in water overnight. It will make the rinse more conditioning. But you can use a squeeze bottle or your old shampoo or conditioner bottle. Massage into your scalp and hair and leave it on for 5 minutes or so to do its work of nourishing and conditioning. Next, rinse with water. Done! Enjoy your super soft, beautiful hair! Tip: If your hair gets very frizzy, apply a few drops of almond oil or shea butter while your hair is still damp. This will help seal the moisture and give you a smooth, glossy finish. Other herbs that you can try adding along are: lavender flowers, chamomile flowers, hibiscus flower and flax seeds. Since the conditioner is all natural, it will keep in the fridge for a week. If you think making it every week is a pain, then make a big batch and freeze it in ice cube trays and it will last for months. If you are using fresh sage leaves, take a handful as it’s difficult to measure out. Or if you are using dried leaves then stick to 1 tablespoon. Where to Buy the Herbs? You can buy marshmallow root online or in the health food stores. As far as buying sage goes, you can buy fresh leaves and use them. If not get dried sage leaves from the supermarket or buy it online. You see as the withered leaves came back to life after soaking them in water, your hair too will become soft, smooth and silky with these conditioning herbs. And dry hair, breakage and difficulty combing is a thing of past. If I want to use fenugreek seeds and I soak them overnight then do I boil the seeds and the soaking water the next day? Can you use the powdered forms of these herbs? I really enjoy all the information and also love that it’s all natural. I’ve always had very dry hair so I will be trying these remedies and see how they work on my hair. Hello Mina, I’m always curious with your mails, I want to ask what you recommend for thin hair. If I can, I only wash once a week, but as we use to go to the sea in weekends, sometimes more, I have to wash maybe two days in a row, sometimes I put oil still with the salt, before washing to get a bit of moisture, or for untangle. I wander what is best before shower being salty, if it’s better to brush before shower or after as it falls more. With jojoba, argan and coconut oil, I can only put a little bit as it stays after I shower, I used marsmallow rinse and didn’t work for me, I’ll try fenugreek and sage. Now using logona argan shampoo, but I’m needing some conditioning, tried coconut milk which was really delicious but too much for my hair, I had to wash again with lemon. So trying to find a good combination to nourish and untangle, also wandering if do all (put treatmet and brush) before shower even if I’m salty from the beach, and what to do when it comes to wash often because of going to the sea. I thank you for your mails, research and for sharing your inspirations, as well as for your patience and attention. Dear Eli, you can try aloe vera or aloe vera with honey. Both are conditioning as well as cleansing. I’ve been following your blog for years. I’m very interested in knowing how long your hair is now. It ll be great if you post a recent picture or mention in inches, please..
Hi Shivani, after the hair growth challenge I did, I cut them short. Donated the length to little princess trust. Since then, I keep them about shoulder length, I prefer it.